"Everything's a risk. Not doing anything is a risk. It's up to you." Maddy hasn't left her house in seventeen years. She spends her days in her white room, with her books, her mother, and her nurse, Carla, for company. One afternoon, a moving van arrives next door, and suddenly the precautions Maddy's forced to live by as a result of her disease are no longer ignoreable. Because the new neighbors have a son. A 'dresses in all black', wall climbing, butterfly inducing son named Olly. Madeline Whittier has SCID, a disease which makes her allergic to just about everything. As a result, Maddy's spent her whole life in her sterile house, where an airlock keeps anything potentially dangerous from entering. Even with this, Maddy comes across as cheerful, down to earth young lady; content with her status in the scheme of things. After Olly, an equally well rounded character, Maddy is forced to come to terms with the fact that she's never going to have what could be considered a 'normal' life. Striking up an online friendship with Olly, she suddenly finds herself going through the ups and downs of first love. Together, with the help of her nurse, Carla, Maddy and Olly take their relationship to the next level; hanging out together, in person, within the sterile environment of the Whittier house. From Olly and Madeline, to Olly's father and Maddy's mother, every character was richly developed and real. Even the revelation near the end was still a believable thing - disconcerting, yes, but believable. I loved Yoon's style, and the layout of the book. Further, the illustrations sprinkled throughout made me feel as though I were one of Maddy's tumblr followers, privy to the inner thoughts of a girl who's trying to make the most of the life she's been dealt. 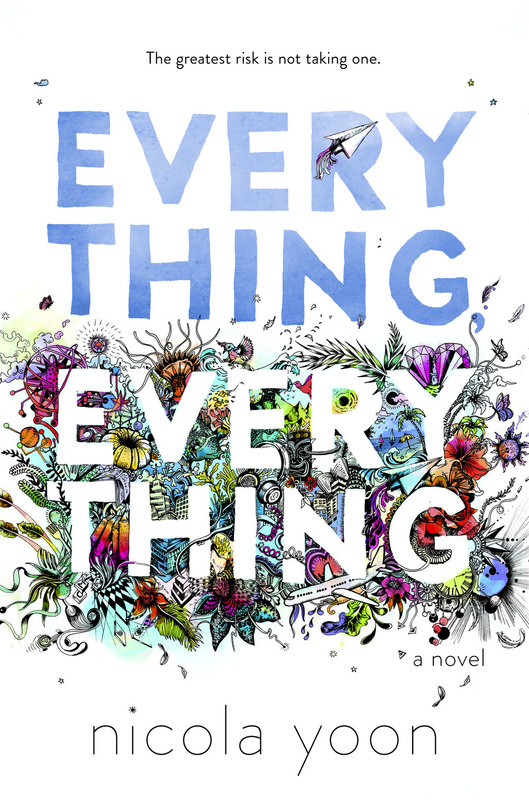 Nicola Yoon has crafted a masterpiece of a debut. 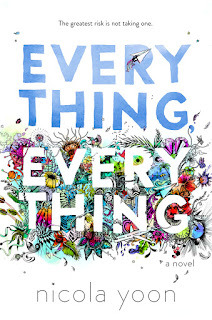 A book about family, love, and growing up, Everything, Everything is one of those books I know I'll be recommending to anyone who asks for advice on what to read next. Needless to say, I loved, loved everything, everything about this book! So much so, that as soon as I finished it, I called my local bookstore to see if they'd gotten their copies of the book early so I could buy a copy for my library. Alas, no luck; but you can bet I'll be out, making my way to the store when this review goes live on Everything, Everything's book birthday.